'Tis the season here in Maui. The season for whale watching, that is. Each year the humpback whales spend their summers feasting on delicious krill up in Alaska and then cruise to Hawaii to calve and teach their baby whales to swim. The thought of a baby whale is so cute. 12-14 feet long and one ton cute. I went on my first whale watching excursion of the season right after Christmas. We took a catamaran through Trilogy Excursions straight from the beach at the Ka'anapali Beach Hotel. Not too far from the shore we saw lots of spinner dolphins. Apparently for each enthusiastic dolphin we saw leaping (and yes, spinning), there are 2-3 more snoozing beneath the surface. Dolphins, like whales, are hard to photograph. They are wild animals. This is not a show at the aquarium. At any given moment they will launch themselves into the air. By the time that you do a little dance and squeal "look at the whale/dolphin!" it's all over. It's almost impossible to get a picture unless you taken constant shots. Or you get lucky. Or maybe you're a professional with endless patience. 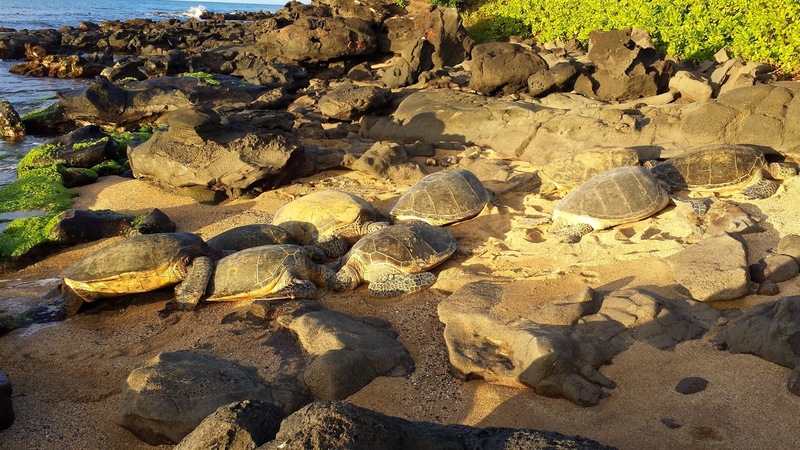 Your odds of a great wildlife photo are much better if you see sea turtles napping in the sun. Or can take stylized pics of the sail and sky. Instant awesome. I know I will go on another whale watching cruise. And probably another after that. Because I still want my "I saw a whale" shot.